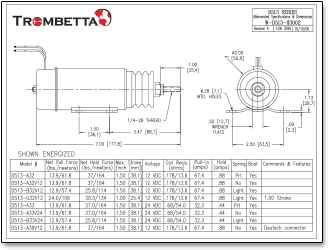 Trombetta’s D610 Series solenoid contains an integral cut-out switch for controlling the dual winding coils, providing the benefit of high energy pull performance combined with cool, continuous holding operation. 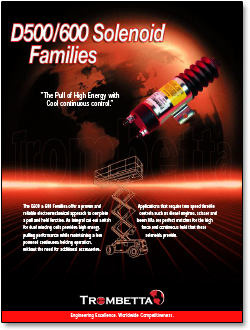 This proven and reliable electromechanical approach to complete a pull and hold function eliminates environmental challenges, including vibration, wire breakage and coil contamination. Applications include two speed throttle control, industrial brakes, locking, positioning controls (scissor lift, boom lift) and large engine and vehicle controls. 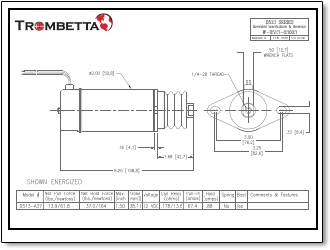 This type of solenoid uses a coil having two sections; a high power, pulse duty Pull winding, and a low power, continuous duty Hold winding. When the solenoid is energized, and the plunger is extended, a built-in switch on the end of the unit is closed, connecting both sections of the coil to the input terminals. During the time it takes for the plunger to pull in, the pulse duty power is drawn. Once the plunger seats, it opens up the internal switch, and then only continuous duty power is drawn. 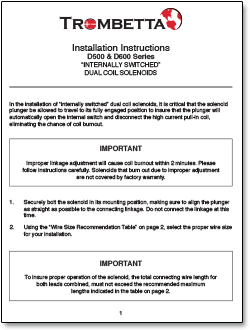 Damage to the solenoid may occur if the plunger does not fully seat. See the literature below for detailed specifications. 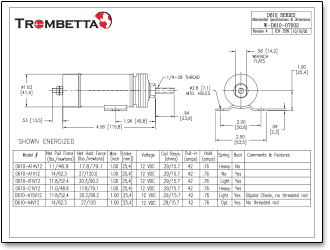 As with all D-Series solenoids, the Trombetta D513-A32V12 solenoid contains an integral cut-out switch for controlling the dual winding coils allowing for high energy pull performance with cool, continuous holding control. This two-wire 12 volt pull solenoid does not need any additional accessories. The D513-A32V12 offers a proven and reliable electromechanical approach to complete a pull and hold function. This solenoid provides 13.9 lbs of net pull force and 37 lbs of net hold force, with a 1.5 inch maximum stroke. It’s rated at 67.4 “pull-in” amps and 0.88 “hold” amps. 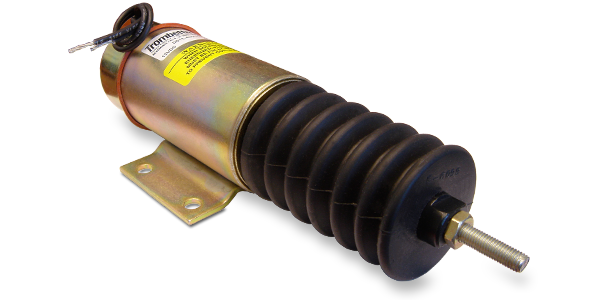 This model is a reliable replacement throttle solenoid for Genie brand lift equipment. See the literature below for detailed specifications. 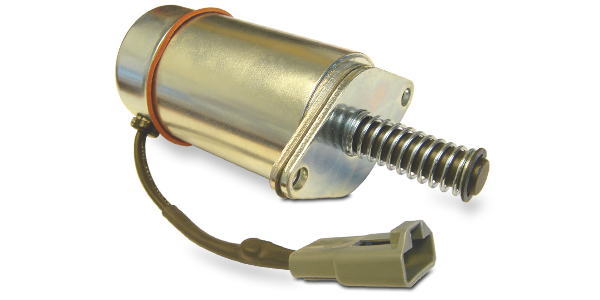 The D513-A30 is a 12 volt pull solenoid with an internal cutout switch and a Packard connector that will pull in and hold against a 9.1 lb spring force. There is no protective rubber boot or plunger connection. Maximum stroke (internal) is measured at 0.67 inches (17 mm). Rated at 66.6 "pull-in" amps and 1.16 "hold" amps. The D513-A30 offers a proven and reliable electromechanical approach to complete a pull and hold function. This model is typically used in industrial brakes, locking, positioning controls and large engine and vehicle controls. 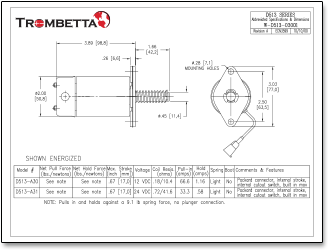 See the literature below for detailed specifications. Click here to purchase D-Series Industrial Solenoids in the MurCal web store.